Need to put out a forest fire? Why not bomb it with chemical-filled missiles? At least that was the plan in 1961. The September 17, 1961 edition of Arthur Radebaugh's Sunday comic strip "Closer Than We Think" imagined that in the future, firefighters would rain down missiles from the sky. 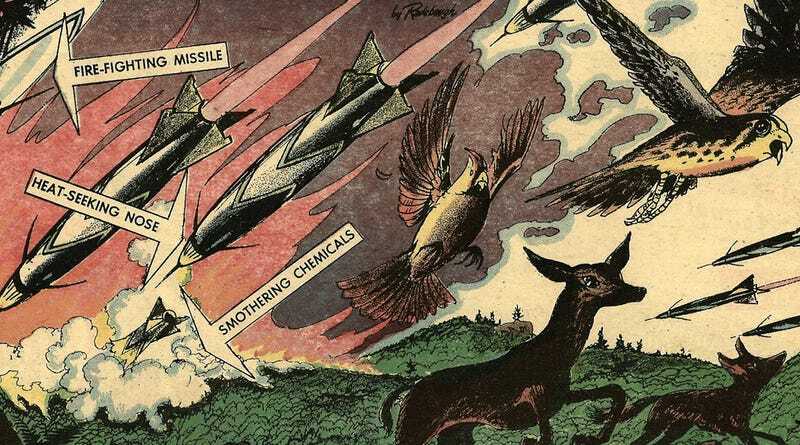 Needless to say, it's hard to tell what the wildlife in Radebaugh's illustration are more terrified of: the fire or the missiles. The old-fashioned way of fighting forest fires — with men and machines digging ditch barriers — is about to give way to spectacular new methods made possible by advances in military and space technology. The new way to quell big fires, especially in hard-to-reach areas, will be with missiles. The latter will be launched in the general direction of the blaze, and their heat-sensitive noses will lead them right to the heart of the conflagration. Preset proximity fuses will then trigger the projectiles and spray their cargoes of flame-smothering chemicals directly onto the fire and in a circle around it, hemming it in from air much more effectively than ground crews could do. Firefighters are currently battling a brutal 1,700 acre blaze in suburban Los Angeles that started just this morning. However, they're still fighting it the old-fashioned way. Many firefighters around the country have fire retardant chemicals, which can be dropped form helicopters. Heat-seeking missiles just aren't in their arsenal quite yet. But this 1961 vision of fire-fighting bombs could still become a reality. Just a few years ago, Russian researchers showed off their own fire extinguisher bombs as the wave of the future. Let's just hope Bambi has time to get out of the way.